Let's transform that 'so-so' watercolour sketch, or not quite finished painting with pen and ink ! The tools are simple and fun to use, and the results are nothing short of 'magic'! We can add detail, that is tedious to do in paint, add character, and focus and clarify parts of the watercolour that seem to have lost their way. Use a lot of pen and ink marks to give a whole new feeling to that watercolour, or just add bits here and there to enhance the image. Success comes quickly and 'mistakes' can be disguised. 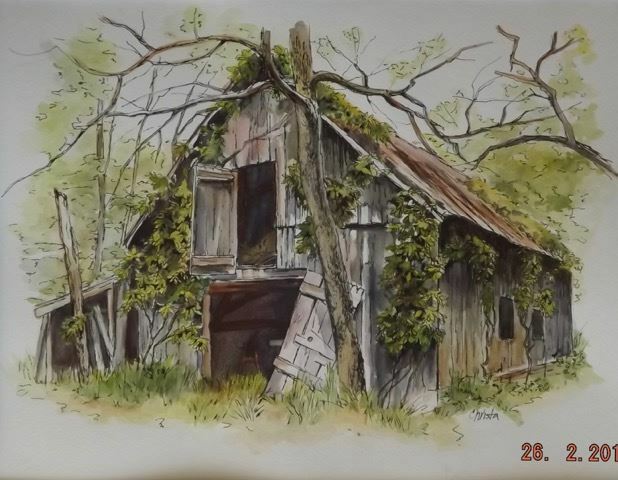 And if you love to paint from life, like Christa does outside in the summer, pen and ink is truly a wonderful addition to your painting skills. The last 20 years teaching art has been wonderful for me. Being able to share all those 'art learnings', and seeing artists creating and gaining confidence in their art, has made these years so interesting, and continues to inspire me to keep on "PAINTING"! My own creative process continues to evolve, the learning and experimentation never ends!